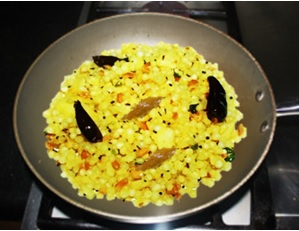 ﻿S﻿abudana khichdi is a very popular dish often enjoyed for breakfast and preparing fasting food for festivals like Navrtri. 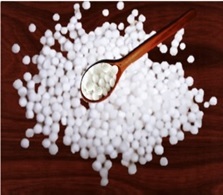 Sabudana is known as tapioca pearls or sago. 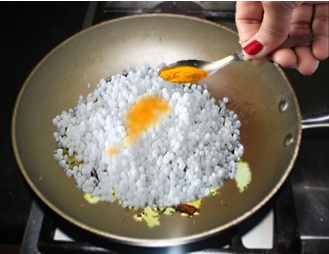 Sago pearls are tasteless but when cooked with spices it makes a wonderful dish. Sabudana khichdi is very simple and easy to make. 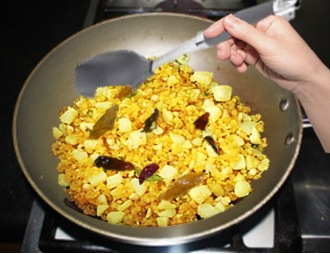 It is prepared with boiled potatoes sautéed with curry leaves and spices and the addition of peanuts gives a nice crunch to the khichdi. 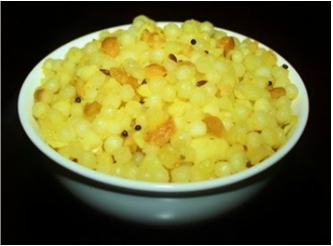 Sabudana khichdi in not only for fasting but it is a delicious snack with a cup of hot tea. 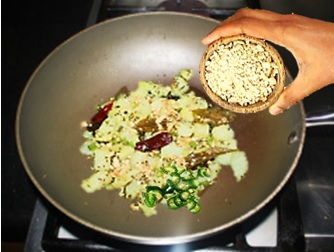 Sabudana is full of carbohydrates and is great for a quick boost of energy. 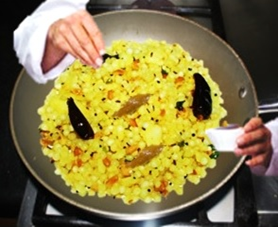 Various dishes are prepared from sabudana, but, sabudana khichdi, sabudana vada, sabudana kheer and sabudana Pappadum are the most popular dishes in north India. 1. 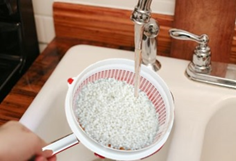 In a strainer add tapioca pearls and wash until water runs clear. you take some in your hands. This is crucial for that perfect kichidi texture. otherwise when cooked the sabudana will stick together in lumps. 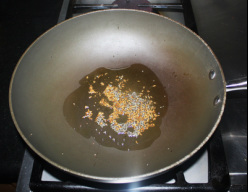 seeds become brown and Mustard seeds start splattering. 8. 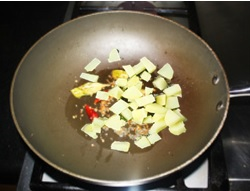 Add chopped potatoes and sauté for 4 to 5 minutes . making sure tapioca pearls does not get sticky and stuck to each other. 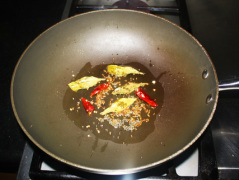 leaves and coarsely grinded peanuts. 1. 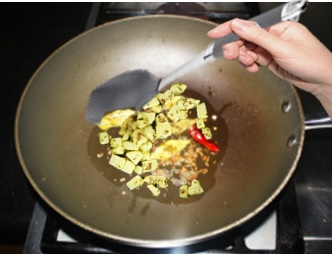 If you wish you could add ½ cup of shelled green peas or paneer cubes. 2. 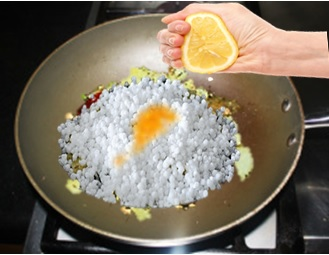 If you don’t stir continuously tapioca will stick to each other. 3. 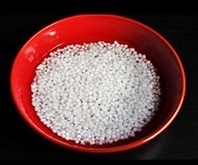 Small size tapioca pearls take less time to soak. soaking. You will have to experiment with your variety. 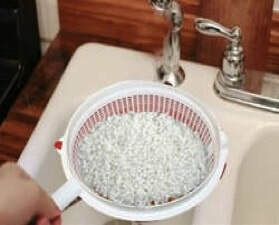 5, lways use shallow and wide bowl to soak sabudana. Never use deep bowl. 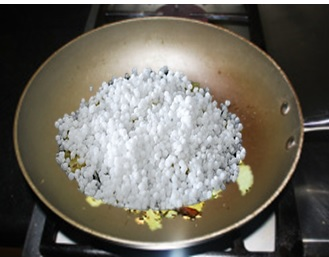 Add just enough water up to just 1½ inches above the sabudana. 6. If you have added more water while soaking, sabudana will become sticky.